I was crying easily for days and feeling very emotional. Then I decided to start watching a new TV show, but it could not be Stranger Things for everyone had been talking about it so much I was already fed up with it (plus all those spoilers on Facebook, why to people do these things?). I went for River because I adore Stellan Skarsgård (ever since he had loads of hair in Breaking the Waves). I watched the pilot and indeed, it is an excellent show, but I felt so miserable at the end I could not bring myself to watch the second episode – I just told my husband: “let’s please watch one episode of The Blacklist now?” – I needed some of Raymond Reddington’s witty lines to improve my mood. 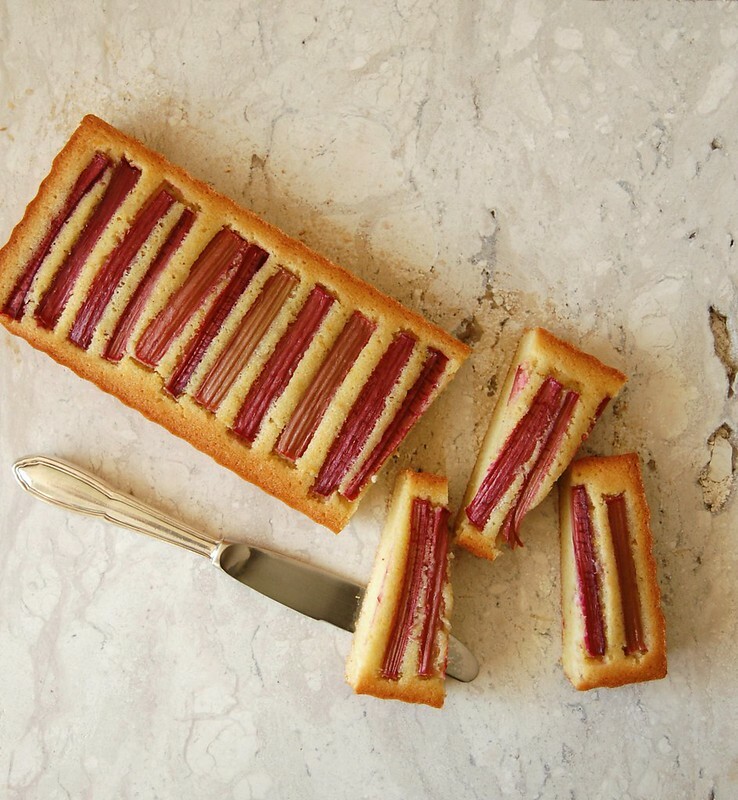 I ended up making two recipes with the rhubarb, both delicious, but decided to share with you the most beautiful of them: the giant financier I made using a rectangular tart pan – I was very pleased when I got it out of the oven, it looked amazing! I used Bill Granger’s friand recipe, one that already worked so well with cherries and pears, and added orange zest for zing. It was delicious, with a nice texture and wonderful flavor. On top of tasting great, the giant financier looked beautiful, so I had a slice of it with a cup of coffee while watching Red Reddington and I was happy again. Place the rhubarb in a bowl and sprinkle with the granulated sugar. Mix lightly, then set aside for 30 minutes. Preheat the oven to 180°C/350°F. Generously butter a 30x10cm (12x4 in) rectangular tart pan with a removable bottom. In a large bowl, mix the orange zest and the icing sugar and rub with your fingertips until sugar is fragrant. Whisk in the almond meal, flour and salt. Stir in the egg whites until just combined. Stir in the melted butter and Cointreau (if using). Pour the batter in the pan and smooth the top. Drain the rhubarb sticks and place them gently on top of the batter, without pressing them onto the batter. Bake for about 30 minutes or until golden and risen and a skewer inserted in the center of the financier comes out clean. Cool in the pan over a wire rack. Carefully unmold to serve. Financiers are best eaten the day they are made, but can be stored in an airtight container for up to 2 days.